Large-combed and wattled roosters, and some hens, are at particular risk for frostbite. Even if you have confined your birds to their coop for the winter, unless the coop is uniformly kept above freezing (an expensive proposition in Alaska), your birds may still be susceptible to frostbite on their combs, wattles, and in some cases, feet. Moisture is a significant factor in causing frostbite in chickens. In south-central Alaska, where winters are damper, it is more common in flocks than in the significantly colder but drier climate of Interior Alaska. If, during the winter months your chickens are confined, your coop builds up excessive moisture you may also encounter problems with frostbit birds. The most common cause of a too-damp winter coop is a lack of adequate ventilation and air flow, but other causes are poorly-cured bedding (such as straw or wood chips), and leaking or carelessly-filled waterers. Comb spikes turn black; when manipulated, they feel hard and are no longer pliable. Comb and wattle surfaces are blistered; most often this looks like buffy, pale patches that frequently are oozing. If either of these occur on a chicken’s wattles, comb or feet, immediate action must be taken to prevent further damage and infection. Check the temperature in your coop ensuring that all areas that the affected bird(s) moves in (floor, roost, nest boxes) are above freezing. If your coop feels damp, muck out and replace all bedding, and double check waterers to make sure there is no leakage. Once frostbite occurs, there is nothing to do for the affected areas except to keep them clean to prevent infection. A mild topical antibiotic ointment can be applied to the frostbite. Vitamin E oil is also good as it helps soothe the pain and encourages skin regeneration. Blackened comb tips will eventually fall off and will not re-generate, therefore, if you have chickens that you plan to show, it is best to prevent frostbite from occurring in the first place. If you live in a cold climate, the best prevention is to choose breeds that have small wattles and combs close to their heads, such as Wynadottes, Americanas and Barred Rocks. If you do end up with a large crested bird, such as the rooster featured here, make sure the bird is kept inside as soon as external temperatures drop to ~25F and make sure the coop is warm and dry throughout the winter. For feet, chickens that roost on perches are more at risk for frostbite. Therefore, having flat, elevated roosting areas forces chickens to essentially “nest”: keeping their feet flat and covered with their thick breast feathers. It is also important to make sure that the places where they sleep are elevated, since floors are the coldest and draftiest parts of a coop. It is a good idea to have a nightlight in the coop. When it gets dark instantly (as when the coop timer shuts off the light) chickens tend to hunker down and sleep right where they are, even if they are on the floor. A nightlight therefore provides sufficient light for birds that happen to be on the floor when the light goes off to find their way to the warmer roosts. This entry was posted in Flock, Health, Information, Roosters and tagged combs, frostbite, health, interior alaska, roosters, wattles, winter. Bookmark the permalink. Hi – Nice article. Just wanted to point out that barred rocks (like all plymouth rocks) have single blade combs that are vulnerable to frostbite. All single combs are at higher risk, relative to pea, walnut, and rose combs. Barred rocks are very often listed as “cold hardy”, which they are, in terms of winter survival and productivity. But not in terms of frostbite vulnerability. Just thought it was important to point this out, because so many people seem to choose chickens from these lists of cold hardy chickens, only to find that they’re dealing with frostbite the following winter. Agreed Janet! I chose barred rocks for that reason too. 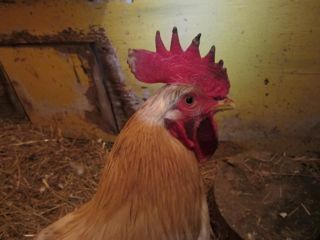 Then I ended up with a rooster, when I ordered all hens, and now we’re dealing with him having frostbite after these brutal temperatures here in New England. Great article though.